City Life Garden Fair & Advent’s Coming! We have an exciting and busy week ahead. As well as our Wednesday night bible study, many of us will be at JJ Market on Saturday to staff the All Saints’ stall at the City Life Garden Fair. The fair lasts from 10am to 5pm, and last year over 3,000 people, mostly expats, attended. It is a great place to make our presence known. Many people had asked what we could give out on the stall. We have flyers advertising our Advent and Christmas events, but somehow that did not seem enough. Some people suggested that we give out free cup-cakes or mince pies. However, that is not really what All Saints is primarily about. Instead, on Saturday, we will be giving out Jesus. That is what we are about as a church. 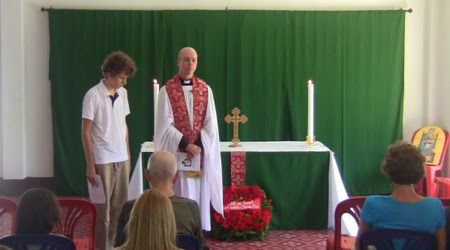 Our table will be set up as an altar, and every hour we will have a short five minute act of Communion. Anyone who wishes to receive the bread and wine – and so receive Jesus – will be welcome. I hope this will show, in a significant way, both who we are as a church, and that we truly seek to share Jesus with all people. With this in mind, we could do with a few more volunteers to staff the stall, especially in the morning. If there are two or three of us, then people can have a break and wander around the other stalls. We would particularly value someone with a car to help carry stuff from the church at 9am. Let me know if you can help! This Sunday we will have our last Eucharist of the Church year, and then on 30th November we will celebrate the First Sunday in Advent. 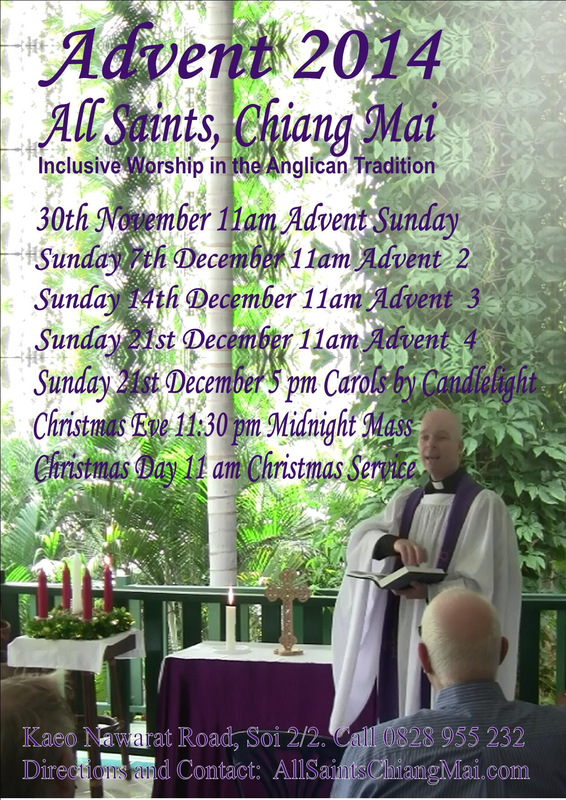 Our service will include the usual Advent hymns, and the lighting of the first candle on our Advent Crown. It will be followed by a light festive pot-luck (please bring Christmas snacks) and then we will decorate the church and Christmas tree together. This Sunday our readings are from Ezekiel 34:11-16, 20-24, Ephesians 1:15-23, and Matthew 25:31-46, and we will be singing the hymns All Creatures of our God and King, Whatever You Do, God We See What You have Given, and Called as Partners in Christ’s Service. You can find the readings via this link. Our sermon will be asking Are you a sheep or a goat? This coming Sunday, 9th November, is Remembrance Sunday. At All Saints we will be remembering those who have been the victims of armed conflict throughout the world during the 20th and 21st centuries. This year is the 100th anniversary of the outbreak of the First World War, the war which was suppose to have been the war to end all wars. Sadly we still live in a world striven with conflict, often now occurring not between nation states, but between different ideological groups within and across borders. We will remember those who have died, and pray for peace. For Remembrance Sunday our readings will be from Joshua 24, 1 Thessalonians 4:13-18, and Matthew 25:1-13, and we will be singing the hymns O God our help in Ages Past, Abide with Me, All my Hope on God is Founded, and The Day Thou gavest Lord is Ended. You can find the readings via this link. The service will include The Last Post and a two minutes silence. Our sermon will be reflecting on war and the Christian hope. Last week we celebrated All Saints’ Day and were reminded that we are part of the church universal. 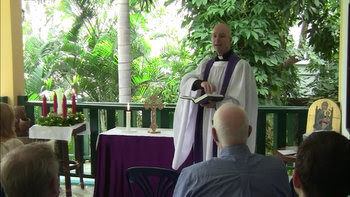 A great service was followed by a short meeting and an excellent pot-luck lunch. 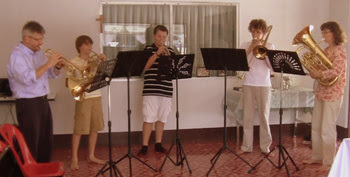 Thanks to our great musicians who played Oh When the Saints, and to all who contributed to the lunch. 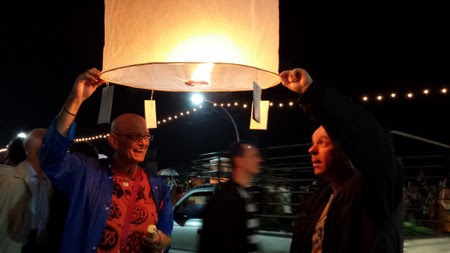 Last night, Thursday, we met at the church at 6pm to join the Loi Kratong celebrations. The cards, upon which were the names of loved ones on All Saints’ Day, were taken down to the river to launch them on the water and into the air.